HFI-580, HiFi/audiophile headphone from Ultrasone in the HFI series. The central part of the cups' exterior, where the headband attaches, consists of chrome metal pieces, which are marked with "L" and "R," respectively. It has an adjustable plastic headband and there's a leather cushion at the very center of its arc for additional comfort. 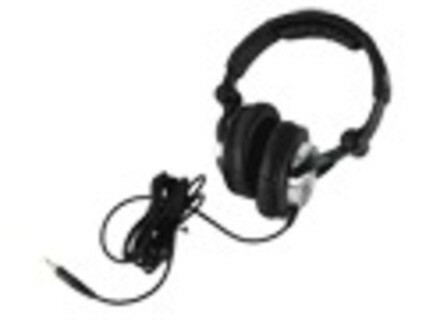 A 15-foot headphone cable is attached to the left ear cup and is terminated with a 3.5mm plug. Included is a screw-on phono plug adapter intended for use with AV receivers and the like. The HFI-580 can be folded for storage in its included travel bag. To learn more about Ultrasone, go to ﻿www.ultrasone.com﻿. Audio-Technica ATH-M10 Audio-Technica introduced its new ATH-M10 Professional Monitor Headphones.